Not long ago, I wrote about net worth vs. net investable assets, and the circumstances under which you might want to track one or the other. While I’m generally most interested in the latter, as that most accurately reflects our progress to “financial freedom, ” I’ve begun to come around on the value of including your residence in net worth calculations. Part of my change of heart on what flavor(s) of net worth is/are worth tracking has to do with the fact that we’ve recently been thinking of building an addition on our home, and it struck that it would be silly to treat an investment such as that as (essentially) a debit when we’d actually be increasing the value of an asset. Sure, it won’t be as liquid, but it’s not like that money would totally disappear. 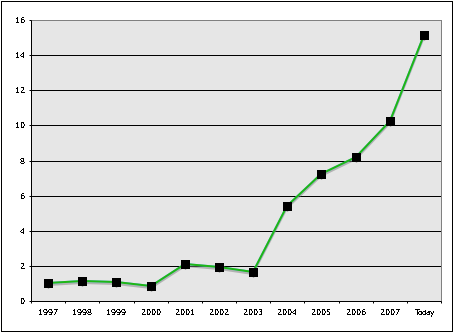 What follows is a table showing the annual and cumulative change in our net worth on a year-by-year basis from 1997 through present. Note that, while I included the value of our home (minus what we owe on it), I didn’t include the value of our cars. While the year-to-year numbers jump around a lot, especially early on, you can definitely see a general upward trend emerging over time. To be honest, I’ve never really tracked this sort of stuff all that closely in the past, and when I first started putting this table together, I was a bit underwhelmed. The main reason for this is that I initially included just the annual change data, and didn’t add the cumulative change column until. But once that was in place, the effects of compounding really jumped out. Since a picture is worth a thousand words, I thought I’d go the extra mile and construct a graph from these data. What follows is a plot of our “relative net worth” starting with $1 on Jan. 1, 1997 and proceeding through this month. As you can see, it’s been a pretty consistent upward march, and for every dollar that we had on New Year’s Day 1997, we now have more than $15. If you do the math, this works out to an average of 29.5% annual growth. Admittedly, this includes a good bit of generosity from family at some key points during the lean years early on, though it also covers a period of time during which we went from zero to four kids. Net Worth Values – The Rich Get Richer? Major Kudos on the upward trend. I like to see people winning! I think it motivates people to know that you can win if you behave with your money. I *love* this chart–and the philosophies and discipline that underpin it. What makes me CRY (well, almost) is: how does one convince OTHERS to buy into the whole “delay instant gratification NOW for greater gratification LATER”? What I mean is, how does one show other folks (to include, importantly, various protected classes) the importance and benefit of something as simple as compound interest? Digerati: We don’t budget in the traditional sense. Rather, we defined (and rather aggressive) savings targets. As long as we’re meeting those, we don’t sweat the finer details of where we’re spending our money. I’m sure we could squeeze even more out of our money if we were more disciplined when it comes to budgeting, but both my wife and I much prefer this sort of “reverse budgeting.” Of course, this approach isn’t for everyone, and it has become much easier for us as our income has grown. I really enjoyed this post. I am truly amazed about how you managed to grow your net worth so well in just 10 years while raising kids. Congratulations, my hat’s off to you! I have had 2 children in the last 6 years and I’ve felt it to be a struggle to keep our spending in control. Yet at the same time, things haven’t been too bad at all as net worth for us has grown too, and this has a LOT to do with stock investments and the value of our home in the last 7 years. Still, I find myself feeling *very* guilty about our spending habits of late. How do you manage to watch the budget while bringing up *four* children? MITBeta: Right, that’s the point of including the house in your networth calculation. Cash on hand decreases, but home equity increases to offset it (or nearly so). With regard to building that addition: As you noted in one of your comments, most of the money spent on the addition actually goes into increased equity in your home. If you build the addition right you will have more in equity at the end of the project than the project cost. But your net worth graph will not suffer at all if you account for it correctly in Quicken. Example: My net worth increases by ~$2000 per month as I pay down debt of all sorts. My assets aren’t increasing by much, but I’m transferring current income into lessening the negativeness of my liabilities (if that makes sense). So the liabilities column is getting shorter while the assets column is growing modestly. Congrats on the impressive upward movement (with four – count ’em, four – kids entering into the mix, no less)! Your archives indicate this site opened in May ’05. How big of an impact did it have in this chart’s upward trend? Debbie: Those dates are Jan. 1 of the year indicated. I started a job with much higher salary mid-way through 2002, and we also had moving expenses (many, but not all, of which were covered), closing costs, etc. So 2003 was my first full year in the new job, the effects of which were evident (in this graph) on Jan. 1, 2004. Make sense? Also, while cars were treated as a straight debit (for historical reasons described above, such that the money left our accounts, and we didn’t add back in the value of the cars) the house wasn’t treated the same way. Our down payment and subsequent payments have been translated (at least in part) into home equity, which *is* included here. What I want to know is what happened in 2003. It’s a huge, exciting jump, and the point after which your net worth stopped going up and down and started going only up. Yet the notes section is eerily blank! @ntguru: The units are arbitrary. I scaled it such that it starts at one dollar in 1997. So for every dollar we had back then, we now have a little over $15. @RootAnn: It’s largely increased income combined with aggressive saving. @mbhunter: Not a lot. Our first house appreciated at about 7%/year for four years. As for our current house, I haven’t factored in any sort of growth since we’ve been in it just a year, and the market’s been sort of strange. I’d be interested to know how much of that gain (of the $14) is due to appreciation in your residences. I think you are right about the value of your home and the value of your car. It’s for that reason that I include them in my calculations. If I do something substantial to improve my home, I want that to be factored. Along the same token, you might want to depreciate some of your possessions over time. I did a sweeping calculation of things like furniture, refridgerators, dishwashers, stoves, water heaters, etc… – pretty much anything that would wear out and would need replacement. Interesting exponential (hyperbolic?) jump the last five years. Anything you can attribute to that vs. the first five years? Investments doing great, higher income coming in, lower spending (probably not, eh?)? I’ve found our #s (only five years worth at this point) have a pretty consistent annual growth rate the last three years. No big jumps, but we haven’t moved or had a job change in the last four years. Nickel, fair enough regarding historical values of autos. Like Brad mentioned I was more talking wrt to general net worth calculations. In your graph, what units is the Y axis in? I remember when I used to chart my net worth on a month by month basis. I could actually correlate my relationships with changes in my net worth. I only had a couple examples to work with, but in both cases, my net worth graph changed significantly about 6 months before the relationship ended. It was a funny thing. I track my vehicle in Quicken, but to make things simple, I don’t track the value on NADA. I simply setup an automatic withdrawal from the value of the car, so that each month its value declines by the same amount. I was somewhat aggressive (I’d rather it be worth more than I think, not less). This way, the asset is tracked, and I don’t have to obsess over the published value every month. Doing it this way…a simplified depreciation schedule, also reminds me of the real cost of ownership. Thus, when I have the bug to buy a really nice car, I can remind myself how much a hit to my net worth it would take each month. That is a good point WRT historical numbers. I was just arguing about the validity of including them in a NW calculation in general. By the way, thanks for this post– the amazing compound growth of your net worth in 10 years helps the rest of us see the big picture. It’s incredible to see what working hard and smart on your finances can do for you. While I see your point re: cars, I was put this together after the fact, and I really didn’t want to deal with figuring the value of (for example) a ’99 Grand Caravan on Jan. 1 2000, 2001, etc. Sure, I can easily look up the current value of our current cars, but I didn’t previously track those data. Simply tacking on the cars at the end, but not during the earlier time periods wouldn’t be realistic. Thus, I opted for consistency. Another thing to consider is that these are now relatively small amounts in the grand scheme of things. While it would bump things up a bit, the graph wouldn’t look much different. I agree with ntguru . . . cars are assets, but are depreciating and you should only count them for what you could dump them for in a pinch– Blue Book / NADA / Edmunds trade-in value as a maximum. The reasoning is the same as your house– you aren’t just throwing money down a hole, and you could get some of it back if you needed to. I used to think excluding automobiles in networth made sense, but then something similar to the home addition you mentioned happened. We started paying off our two cars very rapidly (5-10K / month). If autos (both the asset and the loan on the asset) weren’t included, then that 5-10K/mo went into a complete black hole. If someone had a $40K credit card balance and started making large payments to it that would be reflected in net worth, right? I think it makes sense to include autos in net worth but to be realistic on the asset value — no more than wholesale value with proper depreciation on an annual or semi-annual basis.